Refers to the property feature, I found some of the latest series mobile phones in the market for a relatively balanced compared. With the price range not too far, LG KP220, Nokia 3110 classic and Sony Ericsson W220i is a mobile phone to be relatively the same. In the current mobile phone, multimedia capabilities into the basic capital market to attract vendors. In addition to have the model or the view that attractive, feature-rich products will automatically strengthen the position of a mobile phone in the consumer's eyes. Factors including the price of adequate and affordable. Through the display candybar, the third mobile phone to bring this concept is different. 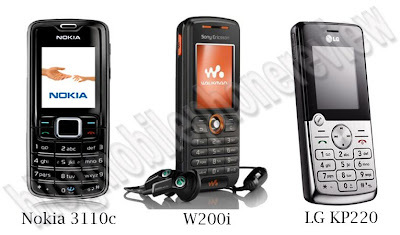 Physical appearance of the Sony Ericsson W220i for example, that vendors show more dominant musical touch. Moreover, the phone itself into the range Walkman phone family. The combination of white and orange colors typical mobile phone Sony Ericsson dominate the phone. Design pattern to follow in the preceding class series Walkman. While the Nokia 3110 classic, tried to present a touch of elegance with dynamic, quality materials with the texture and feel of the classic rounded. Composition design of LG KP220 has the look and metallic insert music button on the left under the main screen. Structure of Sony Ericsson mobile phone keypad is comfortable. Navigation key and a unique combination keypad with high density in accordance with the fingers can give good feedback to use when typing. Nokia 3110 classic also has a keypad is relatively convenient, still rely on some form of products such as the preceding. Quite different with the LG KP220 has a navigation button and Softkey hard pressed to be more powerful when used. Disektor this, LG KP220 Nokia 3110 classic and the more superior than the Sony Ericssson. Because, this is the second mobile phone use with the sharpness of LCD TFT 262 thousand colors. 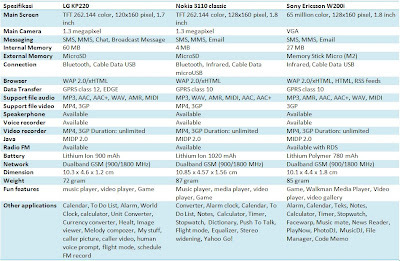 Nokia has a diagonal 1.8 inch screen is active and LG KP220 is only 1.7 inch. Meanwhile, Sony Ericsson is relying on the support CTSN display 65 thousand colors. Fortunately the screen size is still the phone can complement both its rivals that is 1.8 inch. Not surprisingly, the Sony Ericsson mobile phones tend to be minus the color combination. From the view point of interface, users will find that most Sony Ericsson relatively attractive. The icons that look more dynamic and interesting menu that gives satisfaction apart when you access the menu. As usual while the Nokia has the phone display interface typical middle. The icons in the form of a grid is still a mainstay Nokia 3110 classic. Similar to the LG KP220 that displays the menu grid view but with the same color combination. Entering the area then messaging can be seen that the LG KP220 is relatively lagging compared to Sony Ericsson and Nokia. With only rely on SMS and MMS as the primary means of sending messages, clear LG KP220 is not able to compete with its two rivals. Try to see the Sony Ericsson W220i which has a relatively full messaging capabilities, namely SMS, MMS and email. It is quite optimal for the mobile phone of today is the need to have in terms of availability of email message service. Nokia 3110 classic does not want to lose with the stock features messaging features with SMS, MMS and email, such as Sony Ericsson. Moreover, Nokia also includes an application Yahoo Go! For more complete email capabilities of this 3110 classic. In the case of personalization, the presence of the theme to personalize the appearance of the Nokia and Sony Ericsson LG also make a less so in this case the lag. If the view of music that brought the concept of Sony Ericsson, the mobile phone seems to go in the Walkman series family is the most superior in this sector. Main capital of Sony Ericsson W220i is clearly in the music player. The menu on the Sony Ericsson W220i, the user can choose whether you want to use the handset as a music player only (Walkman) or active service with the features mobile. So also interface with the Walkman music player which is quite typical of action make it easier to listen to music. While the Nokia 3110 classic and the LG KP220, must be satisfied with the music interface standard. But Nokia is using the Equalizer feature and stereo widening of the service music. In the case of the resulting sound quality, the headset and the loudspeaker Sony Ericsson is able to remove the output of the good. Meanwhile, Nokia also has a sound quality that is quite good, the sound produced by the headset and the speaker is not too bad. Special LG, the sound quality that came out of the headset is still reliable. Unfortunately, the output obtained from the loudspeaker of the phone is not too fast, so it is less satisfactory. User can also try the FM radio feature that is located on the third phone. However, users must first use the headset to the port is available as a replacement antenna. If you watched the quality of broadcast, the third mobile phone has the ability equivalent. The advantages of the LG KP220 is the availability schedule FM record. While using the Sony Ericsson FM Radio with RDS. In this sector, are the two phones that are using the camera with the power of the 1.3 megapixel Nokia 3110 Classic and LG KP220. At least more superior than the Sony Ericsson which only has a camera with a strength equivalent to VGA. Optimal resolution images that can be captured by Nokia and LG is 1280 x 1024 pixels. While the Sony Ericsson with equal VGA quality, users can only get a picture with a resolution of 640 x 480 pixels. Although the results obtained by the third camera is relatively standard, without autofocus or flash integrated, but if the photo is measured results from both the Nokia two rivalnya on. Picture more sharpness of focus with the most high. Furthermore, in addition to work as a photo, the camera on the third enabled mobile phone can become a video recorder. With record unlimited length, users can record their own video clips in 3GP format. However, the special LG KP220 mobile phone, there is the option of recording video in 3GP or MP4 format. Along with the expansion of the internet on the phone, they have adequate support facilities such as the Internet WAP browser with GPRS data transfer. Although the ability is still the standard size for the latest mobile phone, but already good enough to load the page wap site. LG KP220 on the transfer of data with a better class 12 GPRS and EDGE. Two saingannya simply rely on GPRS class 10 to explore the virtual world. LG surfing the internet the result is relatively faster than the two saingannya. In the case of connectivity, it provides three different options. Nokia offers three options for data transfer path that is the USB data cable, Bluetooth and infrared. While the media connection on the LG KP220 is available only kbel Bluetooth and data cable. Sony Ericsson has infrared and USB data cable. Support for external memory cards and the LG KP220 Nokia 3110 Classic supports microSD slot. Meanwhile, Sony Ericsson W220i can use the card Memory Stick Micro (M2) and included in the sales package. Meanwhile, for the internal storage, LG KP220 has the largest capacity of the two rivalnya that is 60 MB. While Sony Ericsson has a 27 MB internal memory and 4 MB of Nokia. In case the supply of energy sources to survive during use, the Nokia 3110 Classic on the battery capacity is the largest Lithium Ion 1020 mAh. LG KP220 while relying on Lithium Ion Battery 900 mAh capacity. Sony Ericsson is slightly different because it uses a battery Lithium Polymer 780 mAh. Besides winning, Nokia 3110 Classic seems to have the support of the battery resistance is greatest. In charging the phone once it can survive for 3 days in standby time. Meanwhile, for the LG KP220 and Sony Ericsson W200i only able to survive for 2.5 days. View the price offered, Sony Ericsson W200i offers the features are complete enough, especially reliability support the music, from the player to feature. while if the user more like a digital camera with features that optimize the multimedia equivalent Nokia 3110 Classic is a choice. Special LG KP220, only features in the radio because it provides superior schedule FM record.